The 18-year-old becomes the first Canadian player to win a WTA Premier Mandatory tournament. Sunday afternoon’s BNP Paribas Open women’s final between World No. 8 Angelique Kerber and surprise finalist Bianca Andreescu was all about making history. It was a true generational clash between an established 31-year-old, three-time Grand Slam champion from Germany, who played extraordinary defense at times, and an upstart 18-year-old born in Canada of Romanian parents, whose attacking style could be best described as otherworldly. Both were facing each other for the first time and each was playing in their first WTA Premier Mandatory final. Who could raise the level of their game best? The answer, it turned out, after two hours and 18 minutes of thrilling hard court drama, was Andreescu. Playing in just her second tour-level final, the Canadian teen from Mississauga, Ontario, prevailed over the eighth-seeded Kerber, 6-4, 3-6, 6-4, by staying strong through adversity. It was her seventh consecutive win and the victory – raising her season record to 28-3 – improved her world ranking to a very impressive No. 24. Pretty impressive considering she started the year at No. 152. En route to her first WTA Premier Mandatory final, Andreescu demolished former World No. 1 Garbiñe Muguruza, 6-0, 6-1, in the quarterfinals, then endured a grueling 6-3, 2-6, 6-4 comeback victory over sixth-seeded Elina Svitolina in the semifinals on Friday that tested her mettle. During a TV interview just before walking out to a packed Stadium 1 at the Indian Wells Tennis Garden on the hottest day of the tournament, with temperatures hovering around 85º Farenheit, Andreescu said, “I’m just going to mix it up and give it my all.” Kerber, who has been to 29 WTA Tour finals and knows a thing or two about pressure, seemed focused and ready. Ranked 60th at the beginning of the tournament, Andreescu was the first wild card to reach the final at Indian Wells. By winning, she became the youngest champion of a WTA Premier Mandatory tournament and the youngest woman to triumph in the California palm desert since Serena Williams at age 17 accomplished the feat 20 years ago. All of a sudden, she’s among pretty good company – not to mention that she’s the seventh different Indian Wells champion in the last seven years. “Her run here at age 18 as an unseeded wild card has been a revelation,” wrote New York Times tennis columnist Christopher Clarey, in describing Andreescu’s ascent. Andreescu looked right at home from the start of the final, playing confidently and aggressively, while Kerber cane out passive and tentative. She held serve during her first five service games without facing a break point. Then, ahead 5-4 following a break of Kerber’s serve in the second game, Andreescu fired her first ace of the match for set point, and put away the 40-minute opener 6-4 by hitting a well-placed, cross-court forehand winner that Kerber was unable to get her racquet on. Perhaps, it was some creative visualization by Andreescu, who meditates for 15 minutes daily? Maybe, but shot to shot, point to point, Andreescu kept Kerber off balance with a variety of different looks. Then, the tenor of the final changed in the second set when Kerber, who had seen just one break point all match, took advantage of her limited opportunities and broke Andreescu in the fourth game for a 3-1 lead after saving two break points in the previous game. Kerber won a tight final game to capture the second set 6-3, as Andreescu had 19 unforced errors. It set up the 206th three-set match of Kerber’s WTA career. Talk about tennis that puts you on the edge of your seat. At 2-1 in the third set, Andreescu took a medical time out for treatment on her right arm and shoulder. Then, at 2-all, she saved a break point with a forehand winner. However, Kerber broke Andreescu on the next point and, suddenly, the teen looked out of gas. It prompted an on-court visit by Andreescu’s coach, Sylvain Bruneau, the head of women’s tennis at Tennis Canada, during the change over that proved to be a turning point. Bruneau listened to his pupil and calmly responded, “You have to push through.” He offered Andreescu encouragement and kept her focused – and she took his advice to heart. Immediately, Andreescu got the break back and held serve – and suddenly she was ahead 4-3. It prompted the WTA Insider, Courtney Nguyen, to tweet: “Maybe venting let out the frustration and the teen can find another burst of energy.” Then, Andreescu broke Kerber, again, for a commanding 5-3 lead, and it gave her a chance to serve for the title. Instead, Kerber fended off three championship points after Andreescu netted an attempted drop shot on the third one. It pulled the German to within 5-4 as she took advantage of her opponent’s lack of experience in championship moments. However, when the Canadian’s fourth championship point arrived in the next game on Kerber’s serve, this time she made the most of her opportunity. When it ended, Andreescu celebrated her biggest moment of joy by kissing the hard court playing surface and then laying on it. Andreescu earned $1,354,010 million (U.S. dollars) for winning, and afterward received lavish praise from both Canadian Prime Minister Justin Trudeau and legendary tennis Hall of Famer Rod Laver. A year ago, Naomi Osaka, unseeded and ranked No. 68, won Indian Wells, and it served as a springboard to winning two Grand Slams – the U.S. Open and the Australian Open – and rising to No. 1 in the world rankings. Maybe, it can happen to Andreescu, too. “Hopefully this moment can be a great inspiration for many young athletes because like I always say, if you believe in yourself, anything is possible. And like my mom always told me through the years, if you work hard, you dream big to get big, then you can accomplish so many things. Looking back, let’s hope we see more of Andreescu versus Kerber in the future. (They could meet in the third round at the upcoming Miami Open.) This was a match for the ages – perhaps the start of a great rivalry? – and it served as a wonderful exclamation mark to Andreescu’s epic title run from wild card to champion. • By improving her 2019 win-loss record to 28-3 (which includes WTA, Fed Cup and ITF competitions), Bianca Andreescu is the winningest player across all levels. Her run to winning her first WTA title included defeating four seeds and two Top 10 players – Elina Svitolina in the semifinals and Angelique Kerber in the final. Despite losing, Kerber will move from No. 8 to No. 4 when Monday’s new rankings are released. 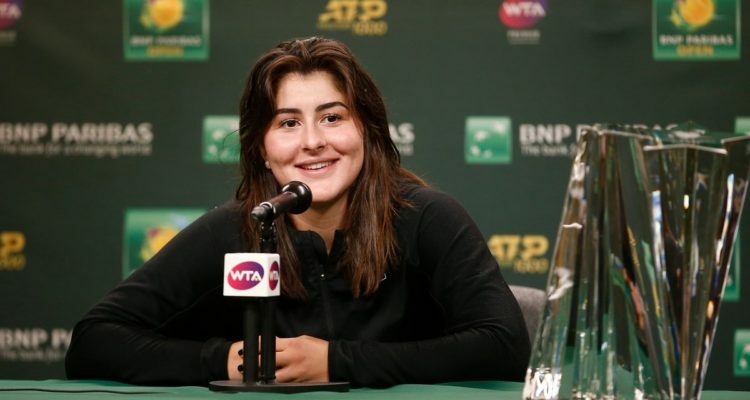 • Thanks to Andreescu’s title run at Indian Wells, three of the biggest WTA titles of 2019 have been won by players aged 21 and under: Naomi Osaka, 21, at the Australian Open; Belinda Bencic, who was 21 at the time, at Dubai, and now Andreescu, 18, at Indian Wells. This entry was posted in WTA Tour, WTA Tour News and tagged Bianca Andreescu, BNP Paribas Open, Indian Wells, WTA.